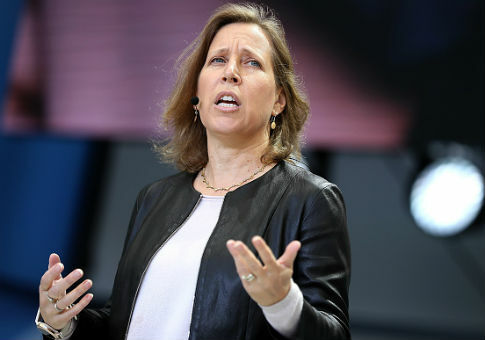 YouTube CEO Susan Wojcicki was one of several tech and media executives who attacked Facebook at a conference in California on Monday. Wojcicki suggested that Facebook should continue to de-emphasize news content and focus on fostering social networks, the Guardian reported. "They should get back to baby pictures and sharing," she said at Recode's Code Media conference outside of Los Angeles. Wojcicki also said that she is not too concerned about Facebook's attempts to establish itself as a video platform. "[Y]ou always have to take your competitors seriously, but you don't win by looking backwards and looking around," she said. BuzzFeed co-founder and CEO Jonah Peretti also took the opportunity to take a jab at Facebook, arguing that the social media giant should extend its revenue-sharing practices to its news feed. "Most of Facebook's revenue is in News Feed, and that's where they've not shared revenue," Peretti told the conference. The Guardian noted that Facebook does split advertising revenue from instant articles, or videos posted to the site. Peretti said that it is not enough, however. "These are places with a lot less distribution, so there's a lot less revenue," he said. The BuzzFeed chief did not stop there, adding that Facebook needs legitimate news content to avoid becoming overrun with malign actors spreading fake news. "Facebook will have no chance to control what's in News Feed if the only lever they have is traffic, because the only way to say ‘we want influence over this content' is if you have a lever of content and a lever of revenue," Peretti said. Facebook defended itself at the conference. The company's head of News Feed, Adam Mosseri, and news parternships manager Campbell Brown argued that the social network is working to help publishers in other ways. Brown pushed back against the idea that Facebook is a blank slate for all content, saying that the site is fine with "leaning into quality news" and "broadly trusted publishers." Mosseri added that Facebook's "integrity effort" is based on the company's "values" and "standards," but said the network is still not sure how to go about it. He said a key company goal is to increase users' "time well spent" but no one is sure what that exactly means. "We're trying to figure out how to best measure and understand that [and] trying to understand … what people actually find meaningful," Mosseri said. Facebook has faced criticism in recent months for not taking more action to ensure that news stories on the site are legitimate, particularly after reports revealed that Russia bought Facebook ads as part of its efforts to interfere in the 2016 U.S. presidential election. This entry was posted in Culture and tagged Buzzfeed, Facebook, Russia, Social Media, YouTube. Bookmark the permalink. Charles Russell is a Media Analyst for the Washington Free Beacon. Before joining the Beacon he worked at America Rising and has spent several years on multiple campaigns. Charles can be reached at russell@freebeacon.com, his twitter handle is @charleswrussell.